Createspace Independent Publishing Platform, 9781977771919, 44pp. "Gram knew that raising dairy goats would be a lot of work. She was prepared for the daily chores of milking, feeding, and hauling hay. She hoped that the goats would be affectionate and playful. She had no idea just how precocious they could be ... especially Misty." Mischievous Misty is the true and "absolutely delightful" (--Greg L., Florida) story of a curious little dairy goat who lives in The Meadow on Gram's farm. Misty loves to be near Gram and must know what she is doing at all times. When Gram carries a water bucket through The Meadow, Misty tries to see what's inside and spills water all over Gram. When Gram tries to pour feed into the trough, Misty tips the pail over and spills grain all over the ground. Each time Misty gets into a tangle, Gram patiently tries to figure out how to prevent future mishaps. 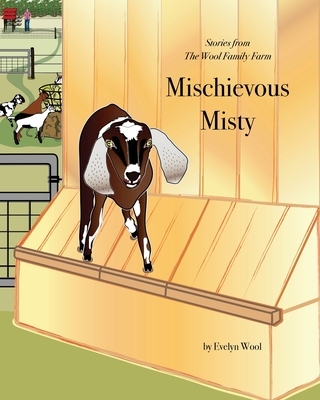 The story of Mischievous Misty introduces readers to one facet of the author's real life on The Wool Family Farm, which includes chickens, cows, donkeys, ducks, guinea fowl, pigs and sheep in addition to dairy goats. New to farming, the author and her family turned their world upside-down to try their hand at living off the land, discovering the joys and pitfalls of working with farm animals along the way. Unlock the wonders of Misty's world and get a glimpse of what raising dairy goats is really like. Mischievous Misty features many special extras, including photos of the real Misty, descriptions of the many dairy breed types, an invitation to join the Misty Fan Club and more. The adventures have just begun. Evelyn Wool spent numerous childhood vacations on a real working farm. When her own children were grown, she began to reminisce about the smell of hay and horses, the sight of cows marching into the barn, and the delight of slurping juicy peaches right off the tree. In 2014, Evelyn and her husband, Robert, moved from Connecticut to North Carolina to start their very own farm where they are learning how to round up cows, out-smart goats, chase chickens, occasionally save pigs from drowning, and much more. Evelyn writes about their fun-filled adventures on the farm's website: TheWoolFamilyFarm.com.